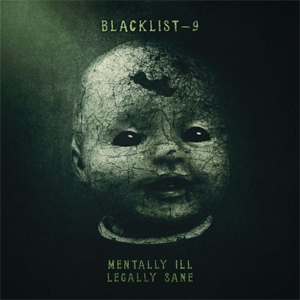 U.S. groove metal band BLACKLIST 9 will release their debut full-length album entitled Mentally Ill, Legally Sane on March 22, 2019 via Eclipse Records. The album was produced by Jeff Collier, mastered by Frank Gryner (ROB ZOMBIE, A PERFECT CIRCLE, COAL CHAMBER), and the album cover was designed by Prateek Mishra. The band features Lonnie Silva (BLACK SHEEP, IMPELLITTERI) on drums, alongside his son Kyle Silva on guitar. Mentally Ill, Legally Sane contains eight tracks which display the band’s raw power and energy. The first single pummels fans with the pulsating “Madness” talking about corrupt career politicians. Other stand-out tracks are “Stand in Line” which tells the story of a rebel who falls for the lies of the establishment, and the title track “Legally Sane” which was written shortly after the jury delivered a guilty verdict in the trial of James Holmes. The band have also revealed their first music video from the album for the first single “Madness”. The video was directed by ZANE, and filmed at Studios 60 in Los Angeles. Watch it right now on KNAC.COM HERE. For more information on BLACKLIST 9, please visit them on Facebook, Twitter, or Eclipse Records.